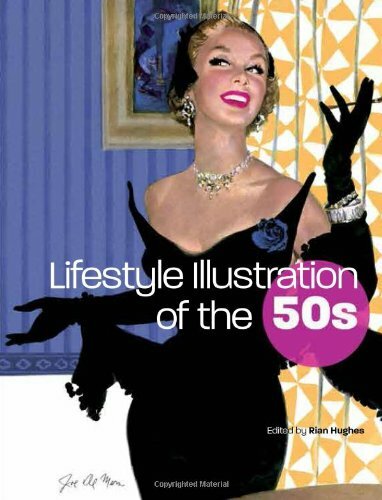 A very welcome addition to the earlier book Lifestyle Illustration of the 60s. This latest one follows the same format as the 60s with over 1300 illustrations and almost all of them in color. All the work is from women's magazine romantic fiction and I find it amazing that more than a hundred artists manage to find so many creative ways to show essentially the same thing: the emotional reaction between a man and a woman. Like the 60s book the artists are British or American though there are a few contributions from continental Europe, Danish Kurt Ard has several paintings included. The prolific Coby Whitmore has the most in the book, more than fifty, all revealing what a brilliant artist he is, especially his compositions. Eric Earnshaw and Harry Hants together have more than eighty between them. Hants did a lot of covers for the British 'John Bull' weekly magazine, easy to spot as you go through the book because they are complete squared-up cover paintings. Other artists that have a good showing include Joe Bowler, Lynn Buckham, Joe DeMers, Gerry Fancett, Francis Marshall, Edwin Phillips, Andy Virgil, Jon Whitcomb and Walter Wyles but only one from my favourite (apart from Whitmore) Bernie Fuchs, he had a better showing in the 60s book. It's interesting looking through both books to notice a change of technique between the two decades. In the 60s book the brush style is much freer and casual, the compositions are more flexible with different points-of-view which is not seen so much in the 50s illustrations. There is a use of much more vibrant colors in the 50s work which by the 60s had merged into lots of red, orange and brown as the dominant colors. Both books show the best of romantic fiction illustration by masters of the genre, a wonderful visual and nostalgic look at a vanished art form.